CHICAGO – What would you do if your child was in jeopardy? We all love to answer quickly and instinctually that we would do absolutely anything but the fact is that we’re incredibly lucky to never be put in that situation. Would you torture someone else? What if you weren’t sure they were responsible? “Prisoners” is a film about a man who believes the only way back to safety and light is through pain and darkness. It’s a harrowing, excellent piece of work, narratively inconsistent in the final act but a film for which all flaws are easily overlooked by incredible technical accomplishments and an ensemble of performers doing close to the best work of their careers. Remarkably so given its 150-minute-plus running time, “Prisoners” wastes absolutely no time on set-up. There’s one piece of overture to this dark symphony, a scene of Keller Dover (Hugh Jackman) hunting with his son Ralph (Dylan Minnette). Keller is a hunter, a survivalist, a man who thinks it entirely possible that the day will come when his skills to save himself and his family will come into crucial play. It’s a brief moment but an important one in the arc of the character and the journey he is about to take. It starts on Thanksgiving as the Dover family, including Keller, Ralph, Grace (Maria Bello), and Anna (Erin Gerasimovich), are breaking bread with friends and neighbors, Franklin (Terrence Howard), Nancy (Viola Davis), Eliza (Zoe Borde), and Joy Birch (Kyla Drew Simmons). Anna & Eliza run home to get the former’s red whistle and fail to return. Older siblings Ralph & Joy tell their parents that they spotted the kids near an RV parked in their neighborhood and the cops are soon informed of the same. Before he can finish his holiday Chinese food, Detective Loki (Jake Gyllenhaal) is pulling his weapon on the vehicle, parked in the corner of a rain-soaked lot. Its driver, the mentally handicapped Alex (Paul Dano), is pulled from the car and interrogated for hours. He doesn’t seem to have the capability to kidnap two girls without a shred of physical evidence in his RV and dispose of their bodies in such a short amount of time. The cops are forced to let him go, returning him to the care of his Aunt Holly (Melissa Leo). Through a series of clues, Keller becomes convinced that not only is Alex responsible but that he’s the only one who now knows where his daughter could still be alive. He takes action. “Prisoners” is as dark a film as you’ll see this year as Loki’s investigation uncovers violence and mental illness behind the doors of this peaceful community. And as Keller’s quest for justice or possibly just vengeance grows more intense, the line between the innocent and the guilty becomes awfully gray. Filmed almost entirely through rain and darkness by the incredible Roger Deakins, “Prisoners” covers the viewer in a thick blanket of despair. With expert editing by the great Joel Cox, who has experience with these kind of sprawling melodramas in his regular work with Clint Eastwood on films like “Unforgiven” and “Mystic River,” and an effective score by Johann Johannsson, “Prisoners” is a film in which each element has been carefully considered in terms of how it contributes to the mood of the entire piece. It’s also driven by fearless, emotional performances. 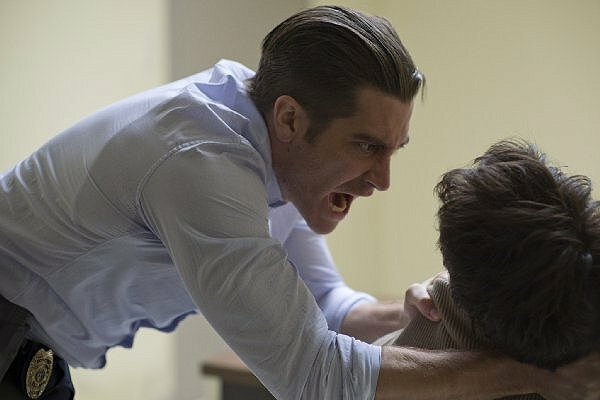 Gyllenhaal perfectly captures a man who has never failed to solve a crime but has allowed that track record to exhaust him. He blinks harder than most people, as if his eyes are permanently bloodshot. He carries the weight of past darkness and immense responsibility in every scene. It’s arguably Gyllenhaal’s best performance. And he’s matched by a cast without a weak player. I could see some arguing that Jackman goes a bit past the top in his emotional intensity but anyone who can imagine how they would respond if their own child were in jeopardy might argue he doesn’t get emotional enough. Howard, Davis, and Bello are excellent but this is Gyllenhaal & Jackman’s film through and through. “Prisoners” is not an easy journey to take. It is a film about dark corners of the world, basements that hold secrets and people willing to go to any extreme to protect their own. There are interesting motifs of religion laced throughout the piece but none of it feels too heavy-handed to distract from the core of the thriller – two men willing to do anything to protect the innocent. With perfect technical elements, great performances, and the kind of dramatic intensity that typically is greeted with the snarky appellation of “Oscar Bait” this time of year, “Prisoners” is an excellent piece of work. 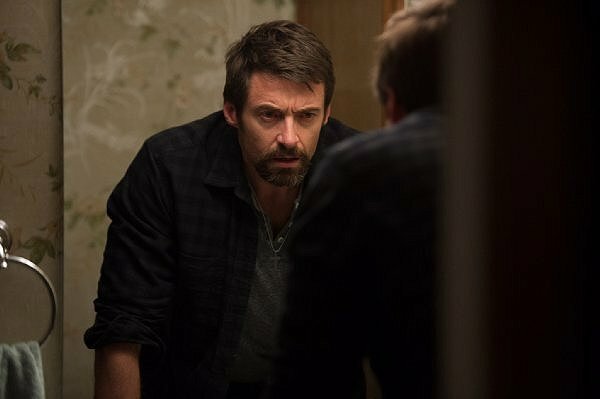 “Prisoners” stars Hugh Jackman, Jake Gyllenhaal, Maria Bello, Viola Davis, Terrence Howard, Dylan Minnette, Paul Dano, and Melissa Leo. It was directed by Denis Villeneuve. It is rated R and opens on September 20, 2013. Submitted by BMoller (not verified) on September 19, 2013 - 4:53pm. You’ve convinced me…I wanna see this.